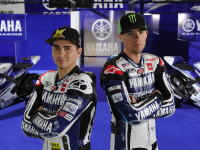 Yamaha Factory Racing 2012 officially launched this evening during a special event at the Jerez circuit in Spain. The event was attended by nearly 100 invited media, selected MotoGP guests and the entire Yamaha Factory Racing team. The event began with a guided tour through Yamaha's newly designed pit garage and refreshed hospitality unit. Riders Jorge Lorenzo and Ben Spies, along with senior Yamaha Motor Racing and Yamaha Motor Co., Ltd. management were present to unveil the 2012 1000cc YZR-M1 machines in their striking new livery for the assembled audience. "It's very exciting to be here so close to the first race. I love the new livery and Yamaha's hard work has given us a very competitive bike to fight with this season. It's good to be here at a different track to test against our competitors before we start next month. It was a pleasure to see so many of our MotoGP media friends here to take part in the launch, nice to see so many take their picture with my bike!" "I'm loving the new bike, man it's great to be back on a 1000cc machine! The riding style is much closer to my natural way of riding which makes it a lot more fun. The colours look great so I'm ready to get out there tomorrow for our final shakedown before Qatar." "Firstly, I'd just like to say a big thank you to all of the media that turned out here for our press conference at Jerez today. For us it was a pleasure to see so many of the media here showing attention and focus on the new MotoGP season which is only two and a half weeks away. We were delighted to be able to unveil our new bike, new colours and new pit garage and hospitality. We've made a major refreshment of all our materials for this year and we're very excited to be at what we consider today to be the start of the season. It'll be very interesting to see what happens over the next couple of days at this test. Having had two successful tests at Sepang, we've moved to a new circuit with new demands. We're quietly confident our bike will perform well here, then after this it's flat out and ready to go for the first race in Qatar!"